Our unique fairtrade coffee brand ‘Perkee’ is farmed by the Soppexcca coffee co-op in Nicaragua. Made from single-origin 100% Arabica beans, it’s a smooth, intense coffee with dark chocolate and caramel notes. In 1999, the charismatic Fátima Ismael took over the struggling Soppexcca coffee co-op. She developed a business plan that would revolutionise it, improving the lives of its members and the community. Its success today is testament to Fátima’s aim of empowering women farmers; coffee profits are ploughed back into education, diversification and health centres. Women are an important part of the farmer co-operatives that produce Perkee, and 32% of Soppexcca’s members are women. Together with the wives of the male participants, they play an essential role in running their enterprise. 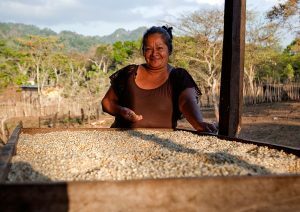 More than 320 women take part in a solidarity savings and loan programme to diversify their families’ income and complement coffee production. Many of them are saving money for the first time in their lives, and are learning business, marketing and credit skills. This community participation helps the women develop leadership abilities and boosts their self-esteem. To find out more about Perkee, please visit the website and see how our coffee turns customers’ frowns upside down.